Victoria’s next-generation trains are game-changers: due to an increased capacity, more passengers will be able to be transported across the metro network, and they’re being manufactured in Victoria. This means more than 1000 local jobs and opportunities for apprentices, cadets and trainees. Work has begun at the High Capacity Metro Trains facility in Newport, where scores of workers are underway with assembly. 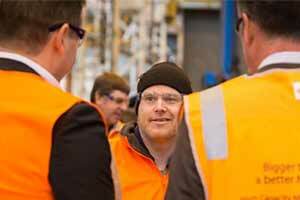 The train fleet will be built with 60 per cent local content, more than any other project of this kind in Australia. Bogie frames are built in Bendigo, traction and electrical systems from Morwell and key electrical components from Hallam. In addition to the locally-sourced materials, workers in need are benefitting via the Major Project Skills Guarantee, whereby at least 10 per cent of the work carried out on Victoria’s major projects will be undertaken by apprentices, trainees or engineering cadets. Young job-seekers and workers looking to re-skill will make up part of the teams on the High Capacity Metro Trains Project, and for the long-term unemployed, or those who have recently faced redundancies from the auto industry, this is a chance to return to work. 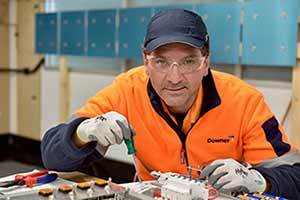 Michael Mikel, a former Toyota worker of 14 years, is reskilling as part of the High Capacity Metro Trains Project. He is learning how to apply both his new skills and extensive previous experience to installing the train’s electrical systems at the Newport facility. “The training facilities here are getting us ready for it and it’s been a great transition” he said. Further north, workers Ashley White and Micah Bearlin-Allardice are building bogie frames (these connect the axels and wheels to the carriages) at Hofmann Engineering. Ashley is a fourth-year apprentice. He was unemployed for a few years, but now has guaranteed work on the project when he graduates next year. Micah’s enthusiasm for the work is closer to home. One of the biggest issues for regional young people is securing work locally. He is thrilled by the opportunity to work close to where he grew up – instead of leaving everything he’s known behind. “I would’ve had to move back to Melbourne, but I grew up in Bendigo and it’s great to get a role back where I grew up” said Micah. Two of Victoria’s biggest growth areas – Melbourne’s north-west and south-east – can expect access to more frequent and more reliable train services as a result of this collective hard work. The 65 new trains are expected to enter service from mid-2019.